This week I ran a combo team disguised as a (mostly) single-affiliation team. That works out to 6 damage each time I hit with Agent Venom. So that requires 3 hits and a couple of points of chip damage to get to 20. Unless I get Agent Venom to hit harder. How to do that? Well, Agent Venom has the Guardians affiliation. Drax: In Pursuit of Thanos and Star-Lord: Reluctant Prince give Guardians +1A/+1D buffs (technically, the latter only gives the buff to attacking Guardians characters but Agent Venom will still benefit when attacking unblocked so it’s not a problem). Then, there’s Starhawk – Precognitive. If he’s active when I field Agent Venom, both of them get +2A for the remainder of the turn. Drax, Star-Lord and Starhawk all have brutal fielding costs. 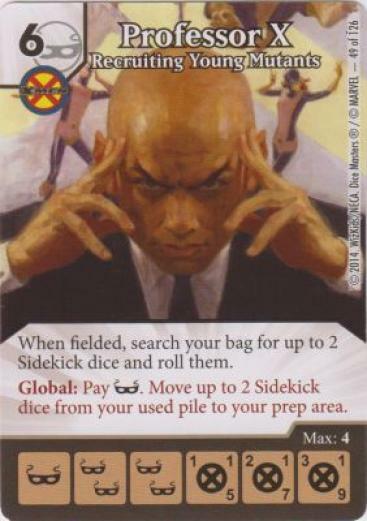 So I included Mantis: Fragmented Mind from the newish Kree Invasion Team Pack to mitigate those costs. Mantis, Agent Venom and Starhawk are mask characters. With multiple mask characters in the build, I decided to use Golden PXG fro ramp. 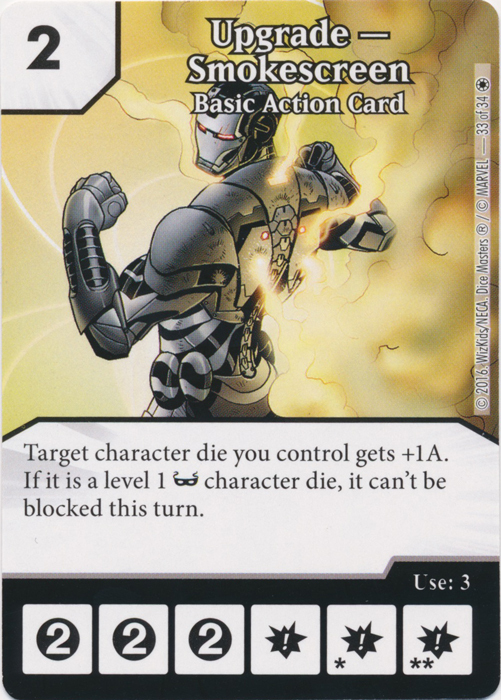 But I would add a Carnage from the team pack of the same name to hobble my opponents’ attempts to use it. The hope/expectation was that once Carnage was out, I’d be using PXG while my opponent was effectively limited to HXG. In addition, Carnage would offer some protection against opponents who came equipped with Kate Bishop/Distraction type globals. Mutation was an obvious choice for my second BAC. 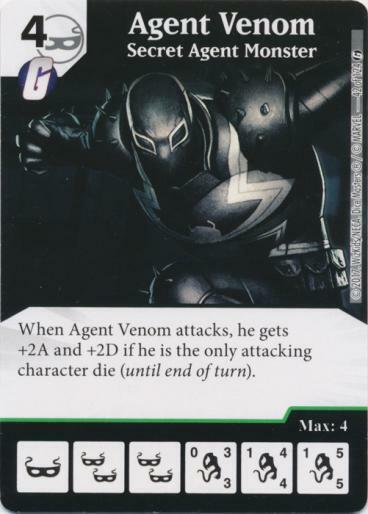 The global should allow me to spin down Agent Venom (or possibly Starhawk) dice to Level 1 so Smokescreen would make them unblockable – and/or spin them up in the Attack Step global window to get another point or two of damage through. With 5 Guardians on the team already, I decided to add Uncommon Yondu in the last spot, as protection against Scarlet Witch (you know the one). If an opponent showed up with her, I’d buy Guardians as fast as I could and rely on burn damage from Yondu, and the multiple buffs my Guardians would be receiving from Drax, Star-Lord and Starhawk. This was mostly a Teen Titans team, relying on the Starfire that does burn damage when fielded. He also had Firestorm: Host of the Matrix which turned out to be a very important piece for him. He was attacking every turn with a Firestorm and a Starfire. 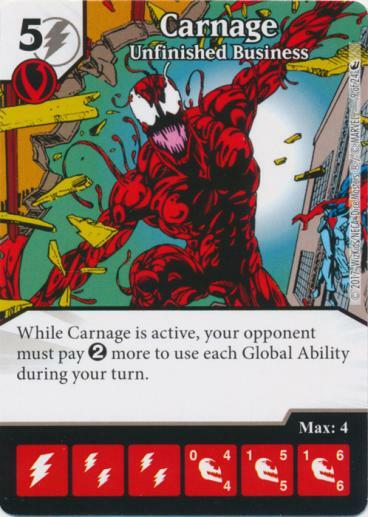 Firestorm’s ability would allow him to KO Carnage and use PXG during his Attack Step global window without the Carnage tax. I was able to put blockers in the field, but I didn’t have the ramp advantage I’d anticipated and his field was bigger than mine was. The game actually went to time, with the time call coming during a Clear and Draw step for me. That meant if would be my final turn. Between dice from the Prep Area and drawn dice, I was rolling two Smokescreen dice and a Yondu. My opponent was at about 13 life, so if I could do 4 points of damage with Yondu, and if I could get Agent Venom through on top of that I might have enough to get lethal. On the initial roll, Yondu came up as a character face while both Smokescreen dice came up as energy. Then on the reroll, both Smokescreen dice again came up as energy, dooming me to defeat. This was against Jourdo’s A Pinch of Pepper team. He sent one Pepper Potts through the field I’d carelessly left empty for 5 damage early on, and then used Loki to keep compelling me to spend life to keep my Guardians abilities active. I got Agent Venom through for hits of 6 and then 7, but got Madame Web out and used her to give me the coup de grace before I could bring Agent Venom around a third time. This was against a very young girl who has recently started showing up for our group. Both her team builds and her piloting are completely unsophisticated – for example, her goal in this game seemed to be to see if she could buy all 4 of her Harley Quinn dice (which she succeeded at). I consider playing a game with her preferable to an outright bye, but it’s essentially a free win regardless. This was not a terrible team, but it had too many moving parts – which, to be honest, I suspected beforehand would turn out to be the case. Star-Lord and Drax both buff Agent Venom when he hits, but only by +1A each. There are buff globals which do the job easier and faster than buying, drawing and fielding two different characters. Starhawk is a keeper if I revisit the team – a potential +2A buff for an Agent Venom strike, or I could use Smokescreen with Starhawk. He can potentially be buffed massively if I can field multiple Guardian dice on a turn where I have Smokescreen available. Are there other mask characters out there that combo well with Smokescreen? Let us know in the comments. Thanks for reading and Happy Rolling! I played similar team with Agent/Smokescreen combo for our Golden tournament like month ago and it worked very well with C Chimichangas and Kal-L/Splinter Teachings global for bigger damage 🙂 Also included Starhawk (he is pretty stromg himself) and for me, the best part was also C Nova Corps Uniform, rest of the team were controllimg pieces (Starlord/Drax are too slow IMO, +1/+1 is not enough). Finished second with this (in final with Collector/Firefly combo).